You have likely come across the term thermal imaging, especially if you’re in the market for a new house. Thermal imaging is a tool that some home inspectors use during home inspections. This technology offers deeper insight into the home inspection by showing temperature differences within the home. Thermal images reveal a spectrum of colors to show the amount of heat energy radiated in areas of the house that may signify problems undetectable by the unaided eye. Read to on to understand how thermal imaging in home inspections improves inspection reports. Thermal Imaging in Home Inspections: Why is it Important? A thermal camera produces images of how much thermal energy different objects are emitting. Understanding the thermal radiation of the objects in the house is important since they can indicate whether components are operating properly or if there are underlying issues. If your home inspector uses thermal imaging in home inspections, infrared pictures will be included in your inspection report. These pictures show changes in thermal radiation that are not visible in normal situations. Variations in heat energy alert the inspector about hidden issues that should be addressed. What Issues Can Thermal Imaging in Home Inspections Detect? 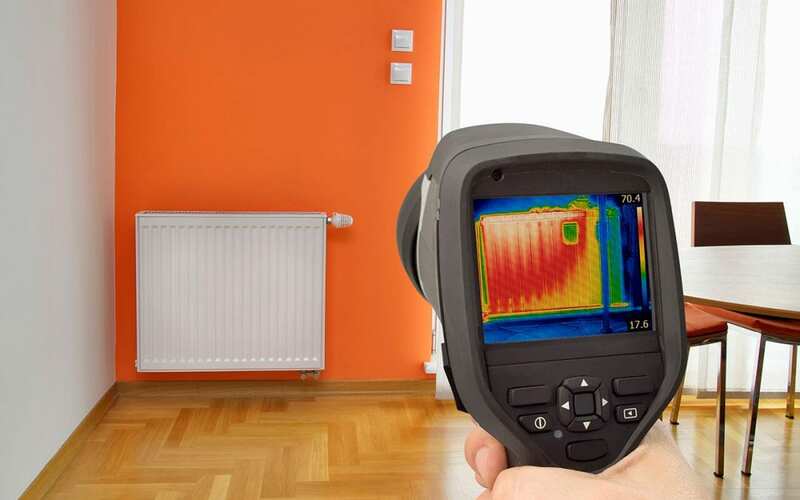 Thermal imaging during home inspections is used to detect issues in a home like deficiencies in insulation, excess moisture, overheating electrical equipment, air drafts, and plumbing leaks. If a house is not airtight, then a lot of energy will be wasted trying to maintain a comfortable room temperature. During the summer, cool air will escape through the air gaps forcing your air conditioner to work harder. Accordingly, during the winter, heat escapes and cold air comes in, creating a chilly draft and causing your furnace to waste energy. Using thermal imaging during home inspections can bring forth issues that might be hampering your house’s energy efficiency, such as cracks, gaps, and missing insulation. Water leaks and moisture damage are feared by homeowners. Unless your house has visible stains or water dripping into your house when it rains, most water intrusion problems go unnoticed until extensive damage has already been done. Fortunately, unwanted water leaks can show up in a thermal picture as an unusual cool spot. For instance, if the house has mold growing on it, thermal images can be used to pinpoint the source of the water that is leading to mold growth. The electrical panel should appear as a consistent temperature when viewed through an infrared camera. You might have electrical hotspots in your home if one section of the fusebox appears to be significantly hotter than the rest. Electrical issues are serious, especially because they can cause house fires if not addressed. Thermal images do not enable people to see through walls; however, they are quite helpful in offering more insight into a home inspection. Once you decide to work with a home inspector who uses a thermal imaging camera, you’ll benefit by getting more information about your home in the inspection report. The main idea behind a home inspection is to learn all that you can about a house before making a purchase. Because of this, it’s smart to work with a home inspector who has the equipment and training to use thermal imaging in home inspections. Aztec Home Inspections offers thermal imaging scans for homes. Contact us to schedule a home inspection and thermal imaging scan in Harrisonburg, VA, and the surrounding areas.